Why stop at just one night--when he can buy so many more...? Greek multimillionaire Luke Devetzi will do anything to get Jemma Barnes back in his bed for a night of blazing passion.... When Luke discovers that Jemma's father is in financial trouble and in need of a loan, he is willing to pay it...but only if Jemma agrees to become his convenient wife! Le Sigh, how far would you go for family?? Girl why is your daddy so trifling?? Jemma was once happily married and is now widowed; she is struggling with the idea that she must move on from her happy memories and the happy life she once had with the perfect man. But as we all know nature doesn't allow for the young to mourn forever. Jemma is faced with so many challenges to her desire to remain numb to the world and then she escapes after being dealt another devastating blow. She had one slip and she can't deal with that slip so she runs away and is faced with a new decision that she once again runs away from because she's not ready to let go. But all things will come to light and the cushy life she's been leading is built on a lie and the decision she hid from comes back to life and it's all spiraling out of control. I loved that Jemma was wary and knew her own mind, had some history and wasn't immediately blown away by Luke. I loved that she wasn't an innocent woman who was down on her luck and wasn't on Luke's level. I mean in the end he does kind of use his position to get her where he wants her and he even has a few moments of being a world class douche especially close to the end. I was just so ready to freak out but he freaks out first and yeah, not totally redeemed because I'm not sure how much I believe Jemma when she comforts him, but yeah. The back and forth between the two gave for an interesting read and was at times quite enjoyable. The story moved quickly and I enjoyed the way the flowed together. 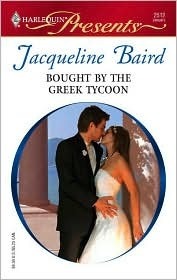 Jackie writes great love scenes and wonderful female leads and I really enjoyed this glimpse into a love story. This was a great break between my heavier paranormal reads, so I liked that I flew through it even more without having heavy character lists to keep up with. Recommend if you're looking for a quick read and something light. Happy Reading.